Variations in different masks, alignment problems and the physical limits of immersion add up to serious issues at 7nm and 5nm. Continuing to rely on 193nm immersion lithography with multiple patterning is becoming much more difficult at 7nm and 5nm. With the help of various resolution enhancement techniques, optical lithography using a deep ultraviolet excimer laser has been the workhorse patterning technology in the fab since the early 1980s. It is so closely tied with the continuation of Moore’s Law that it is difficult to think of one without the other. But how much longer this technology can continue isn’t clear, given the magnitude and breadth of the problems expected at upcoming nodes. The semiconductor industry has been banking on extreme ultraviolet (EUV) lithography for the past decade to circumvent the problems that 193i is beginning to encounter. For example, immersion lithography requires double patterning at 16nm/14nm and quadruple patterning at 7nm. Both schemes work, but they present some new and major challenges. Extra patterning increases the cycle time and cost in both the photomask shop and in the fab. And that’s just the tip of the iceberg. But if chipmakers extend immersion/multi-patterning to 5nm, they may need to resort to the unthinkable—octuple patterning, described almost universally as a nightmarish scheme that is considered unwieldy and too costly. At 7nm and/or 5nm, the alternative is EUV, which supposedly simplifies the patterning flow. With a 13.5nm wavelength, EUV would be able to pattern even the finest detail with a single pass at a 22nm half-pitch. If EUV is ready, chipmakers likely would use EUV to pattern some of the critical features, such as contacts and vias, at 7nm with a single exposure. But at 5nm, they would require EUV, plus a multiple patterning scheme. Still to be seen, however, is when or whether EUV will become commercially viable. And given the uncertainty with EUV, the industry must continue to develop multi-patterning as a backup plan at 7nm and/or 5nm. It might even end up as the primary option at those nodes. If so, octuple patterning would become a reality. Already, more problems are beginning to surface with 193nm immersion. For example, when wires and devices are split into two or more masks using quadruple or octuple patterning, it can affect the overall performance of a chip as well as the yield. That issue grows worse with each new node after 22nm. With quadruple patterning, for example, printing wires or devices is more difficult than with double patterning. There are more masks required. Then, the masks must be broken into different pieces, which in turn are layered on top of each other. Fig. 1: Double patterning scheme. Source: Mentor Graphics. And then there is the problem of overlay, which involves the ability of a scanner to align the various mask layers accurately on top of each other. Overlay has its own set of issues, ranging from line-edge roughness to alignment. If mask alignment is off by just 1nm it can alter the electrical characteristics of a device, affecting everything from performance and power to the integrity of the signals. This has an impact upstream, as well, particularly at the floor-planning stage in the design process. At older nodes, it’s okay to mix and match structures. But at advanced nodes, those structures need to be lined up more carefully to account for what happens later in the flow on the manufacturing side. And downstream, more rigid design rules define what can be done upstream, which affects everything from IP and memory choices, how signals are routed, as well as how much differentiation there is between chips from different chipmakers. Process variation has become more troublesome at each new process node. It affects basic dimensions of any device, and it gets progressively worse as the dimensions of those devices continue to shrink—and more difficult to pinpoint problems when they occur. While existing design-for-manufacturing (DFM) tools take that kind of variability into account with a reasonable amount of accuracy, the number of corner cases increases at each node. Those typically are addressed by adding extra circuits, or margin, into a design. But at advanced nodes, margin can have a big impact on performance and the power necessary to drive signals through longer and skinnier wires. It also can change the thermal characteristics of a design, which is particularly troublesome in the finFET world due to higher dynamic power density. This kind of issue was treated separately from the manufacturing side in the past. But at advanced nodes, many of these issues converge in ways that various parts of the design through manufacturing chain never considered before. And they are made worse by variation caused by multi-patterning. It becomes more difficult to spot those variations, too, because in a 7nm structure not all of the wires are exposed in different masks, and not all of the interactions are obvious. EUV can help considerably at 7nm, and both Intel and Samsung are betting on it for that node. TSMC and GlobalFoundries are not planning to insert it until 5nm—a determination that likely will depend on a variety of issues ranging from cost to the availability of pellicles, actinic inspection of EUV masks, and the quality of photoresists. There are questions about whether multi-patterning will be required with EUV, as well. At this point, there are no clear answers. Mask-writing is straightforward using orthogonal, or axis-parallel, straight edges on the wafer, he explained, but it does take longer. There are more features on the same mask, and slower resists need to be used to write the smaller features on the mask accurately and reliably. Directed self-assembly may play a role here, as well. Industry insiders, who spoke on condition they not be named, said the real play for DSA in the short term may be less about patterning than pattern healing. DSA’s expected insertion point for patterning, in contrast, may be at 3nm—if that node ever happens. Self-aligned schemes are gaining attention, too, particularly for vias. Self-aligned double patterning and quadruple patterning use one lithography step followed by deposition and etch steps to define features. A mandrel is formed on a substrate, then material is deposited on that layer and etched to form spacers. Fig. 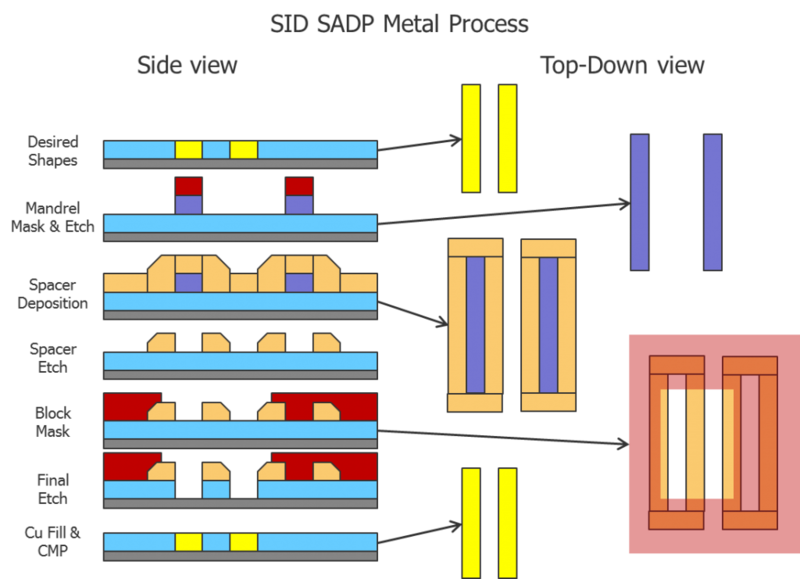 2: SADP Metal Process where spacer is dielectric. Source: Mentor Graphics. In the fab, the big challenge is to execute a multi-patterning scheme with precision. In SAQP, for example, the spacer-based mandrel has three separate critical dimensions (CDs). Each mandrel must be identical in terms of CDs. If they don’t match, there are unwanted pitch walking and variability issues in a device. All of this requires changes in the design through manufacturing flow, though. Multi-patterning brings in yet other issues, too. For one thing, there are simply too many masks at each new node. That slows down throughput in the mask shop, increases the possibility that errors will be introduced, and raises the cost. It is estimated that EUV will trim between 9 to 12 lithography steps at 7nm, compared with 34 using 193i. White noted that of the 90 companies moving to advanced nodes, 35 of them already are doing some form of multi-patterning at this point. They all will be doing multi-patterning by 7nm. In light of these issues with multi-patterning, even the most stalwart critics of EUV are hoping it successfully gets deployed at 7nm and 5nm. DSA utilization will continue to grow, and there may be an opportunity for next-generation lithography, including multi-beam e-beam, complementary e-beam lithography and nanoimprint. But at least in the short term, 193i has run so far past its expected life—and its realistic capabilities—that it is becoming less of a well-known and trusted solution and more of a troublemaker that needs an increasing amount of attention. This is a case where lithography is running up against the wall of physics, and physics is winning. One of the most complex technologies ever developed is getting closer to rollout. Here’s why it took so long, and why it still isn’t a sure thing. Four possible scenarios for patterning the next generation of chips. What comes after double patterning and why you need to understand it. EUV: Cost Killer Or Savior? There’s no such thing as a simple cost decision with EUV at its current power level. But will 7nm (or 10nm for Intel) actually use quadruple patterning? One speculation is that since its features are about ~40nm minimum, Intel/TSMC might push double patterning to its theoretical limit of about ~40nm. So it’s not entirely clear to me what decision has been made by each company. That’s one of the discrepancies that makes it hard to figure out all of this stuff. Presumably Intel’s 10nm is the same as someone else’s 7nm using a 10nm BEOL. There are lots of unknowns about when EUV will be used, when it will be deployed for real, and for what metal layers. That will affect how seriously companies like Intel and TSMC approach multi-patterning. And then there is the cost issue. How many chipmakers are really going to be pushing to 7nm or 5nm, and when? And what kinds of volumes are they expecting to achieve to pay for that? It used to be that we could look ahead two or three nodes with clarity. Now it’s hard to figure out what’s going to happen at the next node–or even how to define the next node with some consistency. That’s one of the discrepancies that makes it hard to figure out all of this stuff. Intel’s claim is their 10nm is not the same as someone else’s 7nm. But alongside this, there are lots of unknowns about when EUV will be used, when it will be deployed for real, and for what metal layers. That will affect how seriously companies like Intel and TSMC approach multi-patterning. And then there is the cost issue. How many chipmakers are really going to be pushing to 7nm or 5nm, and when? And what kinds of volumes are they expecting to achieve to pay for that? It used to be that we could look ahead two or three nodes with clarity. Now it’s hard to figure out what’s going to happen at the next node–or even how to define the next node with consistency. We have a little more information. TMSC’s 7nm will use 40nm SAQP metal pitch. For comparison, at 14nm Intel shrunk its metal pitch by 0.65x to 52nm. If Intel does a 0.7x shrink at 10nm (and Bohr has said multiple times they will be aggressive at 10nm), Intel’s 10nm will smaller than TSMC’s 7nm (depending on how the gate pitch compares to Intel’s 54nm). That’s how non-comparable node names have become. Isn’t quadruple patterning already being used for NAND and DRAM at design rules equivalent to 5/7nm? That should imply problems already resolved. Well, yes, but no, building a gazillion, nicely ordered NAND gates is a whole lot easier than full blown logic, so it is not comparable. The NAND cells are SAQP, so the cost is not prohibitive, as sometimes hinted. Logic may not be so different if it’s already at SADP stage. 40 nm pitch SADP not too different from a set of parallel lines. k1=0.28. The final quadruple patterning for logic may indeed not be the same as memory but perhaps any similarities can be exploited. I have read some estimates that an EUV single exposure is currently more expensive than a standard immersion LELE double patterning and also more expensive than SADP self-aligned double patterning. These estimates make sense as these techniques are being used today for 14/16nm and 10nm production, respectively, instead of EUV. It is also known that the current limit of patterning is around 40 nm pitch as mentioned by witeken, and this uses SADP. However, to get a full node shrink from this point requires going to 28 nm pitch, and that will require LELE double patterning with EUV, i.e., two EUV exposures: http://www.euvlitho.com/2016/P61.pdf . Thus, it seems immersion quadruple patterning will be cheaper going forward, even though it has more sources of variation due to two double patterning steps being used together. question—What about 5nm? Do you need SAQP or SAOP for 5nm? Or EUV? Or both EUV and SAQP. Or magic? Answer: It’s still up in the air. My understanding is that memory uses 2 or 3 masks per SADP/SAQP. But for logic, there will be fewer masks, i.e., cuts, if the spacer masks the dielectric between conducting features rather than the conducting features themselves.